Welcome to the Global Parliamentary Network’s 4th Parliamentary days. I am delighted to see our friend and former OECD Deputy Secretary-General, Yves Leterme, now the Secretary-General of the International Institute for Democracy and Electoral Assistance (International IDEA). It is great to have you back, and to join this discussion on how to tackle one of the biggest and silent challenges of our time: the issue of financing democracy. Today we are launching a key report, a remarkable tool, to address these many challenges of Financing Democracy, with a focus on funding of political parties and election campaigns and the risk of policy capture. Our report poses and answers several key questions: What are the risks associated with the funding of political parties and election campaigns? Why are existing regulatory models still insufficient and not fully implemented to tackle those risks? What are the links between money in politics and broader frameworks for integrity in the public sector? 4 February 2016 - Launch of the report "Financing Democracy: Funding of Political Parties and Election Campaigns and the Risk of Policy Capture". The publication was presented in the context of the OECD Parliamentary Days 2016. Money in politics is a complex area for reform, it’s a double-edged sword. Of course, money is a necessary component of any democratic process: it enables expression of political support and competition in elections. Yet, the increasing concentration of economic resources in the hands of fewer people presents a significant threat to political systems. A recent OECD study shows that the share of the richest 1% in total pre-tax income has increased in most OECD countries in the past three decades. The rise was most spectacular in the United States, where this share more than doubled since 1980, reaching almost 20% in 2012. But even countries such as Finland, Norway and Sweden recorded a 70% increase during that period, reaching around 7-8%. Wealth distribution is even more concentrated than income distribution in all OECD countries. If the financing of political parties and election campaigns is not adequately regulated, money may be a means for powerful special interests to exercise undue influence, and “capture” the policy process. This may take the form of access to public procurement. For example, elected officials “returning the favour” with lucrative contracts to corporations that made contributions to their campaigns. One study highlighted in the report, found that in one country, firms specialising in public works projects could expect a substantial boost in contracts - at least 14 times the value of their contributions – when they donated to a federal deputy (lower house) candidate from the ruling party and that candidate won office. High-spending areas, such as infrastructure and urban planning, are particularly vulnerable to capture. As noted in last year’s Foreign Bribery report: nearly half of all cases occurred in extractive, construction, transportation and storage sectors. But any policy-making process can be a target of powerful special interests. This can result in the adoption of inadequate policies or policies that go against the public interest, preventing improved social outcomes and inclusive growth. And a major casualty is trust. Trust is the cornerstone of effective governance, the main ingredient to promote economic growth and social progress. But like never before, our countries are running dry of this precious asset. In 2015, the number of trusting countries fell to the lowest level ever recorded by the Edelman Trust Barometer. So we have to act now to protect democratic governance, act now to protect equal opportunities, act now to ensure the ability of governments to develop and deliver policies that benefit all citizens. This is the challenge our Financing Democracy report aims to address. Let me share with you some of the challenges and insights highlighted in the report. The report examines how the funding of political parties and election campaigns has evolved, and how political finance regulations have been established across all 34 OECD member and 2 partner countries- Brazil and India. We assess the risks of policy capture through the funding of political parties and electoral campaigns, identify regulatory loopholes and implementation gaps in existing policies, and suggest a comprehensive approach to integrity. Nine country case studies allow for an in-depth analysis of the issue. One clear-cut lesson from this study is that ensuring effective implementation of political finance regulations still remains challenging in many countries. The allocation of public funding and the rules for private funding continue to require special attention to ensure a level playing field for all democratic actors. In many cases, loans, membership fees and third-party funding can be used to circumvent existing rules such as spending limits. Many countries struggle to define and regulate third-party campaigning, in particular to prevent the re-channelling of election spending through supposedly independent committees and interest groups. At the moment, only a few countries, such as Canada, Ireland, the Slovak Republic, the United Kingdom and the United States have regulations for third-party campaigning. Globalisation further complicates the regulation of private funding. Many foreign companies and wealthy individuals are deeply integrated with the domestic political system, blurring national boundaries. Where limits and bans on foreign and corporate funding exist, disclosure of donor identity has become important, which can serve as a deterrent to undue influence. This is why 50% of OECD member countries, including France, Korea and Mexico currently ban all anonymous donations to political parties, and 38% of countries ban anonymous donations to parties above certain thresholds. But the effectiveness of disclosure depends on the information being intelligible, and user-friendly. Many countries have adopted online technologies to enable proactive disclosure. But only a few countries such as Estonia and the United Kingdom have so far managed to ensure that all reports are submitted and published in a standardised, machine-readable format, making them more easily comparable. But regulations alone are not enough. They require independent oversight institutions with the legal authority to meaningfully regulate violations. So it is worrying, to say the least, that independent electoral management bodies currently exist in less than one-third of OECD countries! Another efficient measure to enforce regulations is to use sanctions. For example, since the UK Electoral Commission was given its civil sanction powers, compliance rates have increased by 9%. Yet, many countries still struggle to strike the right balance between proportionate and dissuasive sanctions. Political finance regulations are unlikely to be effective in isolation. What is also needed is an overall integrity framework that includes the management of conflict of interest and lobbying. Otherwise, party and election funding can simply be rechanneled to obtain political influence through lobbying and through third-party financing. Yet, the report shows that fewer than half of OECD countries have so far acted to set or tighten lobbying standards. This is the case despite over 60% of lobbyists themselves supporting the disclosure of their contributions to political campaigns. It is shocking that in only two OECD countries is this information disclosed (Slovenia and the United States). While disclosure of private interests by decision makers is widely adopted by countries to manage conflict-of-interest situations, verification and auditing of disclosure forms are not strictly practiced. The report shows only 10 countries carry out audits or review the accuracy of the information reported by public officials in the executive branch through disclosure forms, while 20 countries verify receipt of the forms. What emerges from these findings and case studies is that there is an empirical deficit in assessing and comparing the practices of political finance regulations in different country contexts. And this has to change, that is what this report is all about, that is what all our work on supporting public sector integrity is about. Money is a necessary part of democracy, but public policy can never be for sale. 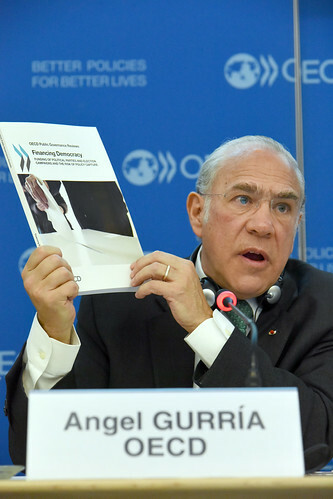 The OECD welcomes the opportunity to work with parliamentarians on these issues: You bring to the table a unique national experience and evidence base in financing democracy. The key thing now, is for us to put our heads together, and work out what works, where and why. This report gives some valuable insights, and I look forward to hearing your views on how we can advance, together, on this important agenda.